We’ve recently returned from the Snaffle Bit Futurity in Reno, Nevada. In conjunction with the annual horse show there is also a Two-Year-Old Select Sale. This sale is for young prospects that have been started and are also working cattle. Perspective buyers attend with hopes of finding their future Reined Cow Horse Champion. We had purchased a very nice buckskin filly, by Shining Spark, that our daughter Sarah had started while working for Carol Rose Quarter Horses. I am proud to say that Sarah did most of the training and represented us brilliantly at the sale. 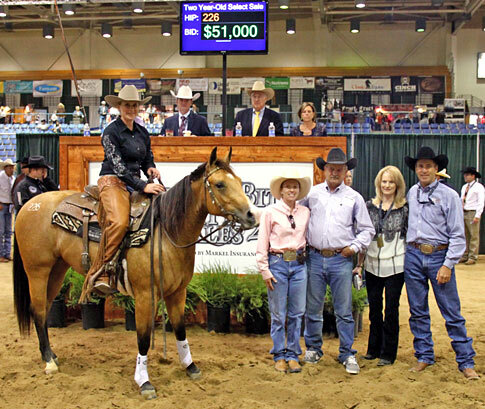 Both she and the filly did an outstanding job and “Shiners Darlin” was the high selling filly and sold for $51,000. If you have not bought or sold many horses at a public auction, the process can be a bit intimidating. An auctioneer is rambling some language you don’t understand. Guys with cowboy hats and ties are shouting back to the auctioneer every time they get a bid. You wave to your friend who just walked in and now you’re told you you’ve just bought an appaloosa broodmare bred back to a mammoth jack with a mule colt by her side! Below is a list of things to consider when buying or selling a horse at a public auction. 1) Fees: You will probably be charged an entry fee, plus 6-10% of your horses selling price, for the opportunity to be in the auction. 2) Rules: Find out if you are allowed to “buy back” or put a minimum bid on your horse. Most auctions allow this; some do not. The prestigious Red Bluff Bull and Gelding sale requires that every horse transfer ownership regardless of the final bid. 3) Present your horse as valuable: This means washed, clipped, freshly shod, and all tack cleaned. You should prepare as if you were entering the show pen. 4) Have your paperwork in order: If you are selling a registered horse, make sure that he is registered in your name. Otherwise it might be difficult to prove that you have the legal authority to sell him. 5) Be prepared to wait for your money: Most auction companies will not pay you until the new buyers check has cleared the bank. Most transactions are settled in 30 days or less. 1) Buyers beware: You are purchasing this horse “As Is.” Any questions you might have in regard to the soundness of a horse need to be addressed before the bidding begins. Many higher end sales recommend that sellers provide x-rays that can be viewed during the days and hours leading up to the sale. Some auctions will have a veterinary inspection completed for every sale horse. This is not a comprehensive examination. However, the process will sift out horses with obvious physical problems and adds value to prospective buyers. • How much training has the horse had to date? • What type of experiences has the horse been exposed to? • Has he ever had any lameness or physical problems? • What’s his strongest and weakest trait? • How long has the seller owned the horse? 3) Arrive early to watch any previews of the horses being offered for sale: Many sales will have a designated time when each horse is previewed for the prospective buyers. This is often a time when you will see them work cattle, rope, or perform other tasks in which they are proficient. If time allows, ask the seller when they will be riding the horse again. Are they allowing others to take a “test drive?” You can learn a lot by watching some other buyer try out the horse you’re interested in. 4) Get a bidder’s number: If you think you might bid on a particular horse, register with the sales office prior to the start of the sale and have your bidding number on hand. It doesn’t cost anything, and it will help your transaction and the entire auction run more smoothly. 5) Attend a sale: You may not be ready to buy a horse but observing an auction will help you become familiar with the process. Being more comfortable with the chant of the auctioneer and following the bidding will better prepare you for when it comes time to raise your hand to purchase a particular horse. Auctions can be intimidating, but they don’t have to be. Most of the personal with the auction company will be happy to answer your questions. They want it to be a positive experience for the buyers and sellers. Public auctions are often the clearest indicator of the fair market value of the horses offered. Regardless of what the seller thinks, the horse is only worth what the buyers are willing to pay on that particular day.